Commended in the Cornwall Tourism Awards 2013/4 and award winning in the 2014/5 Awards, Carvosso Mill is a fantastic space! 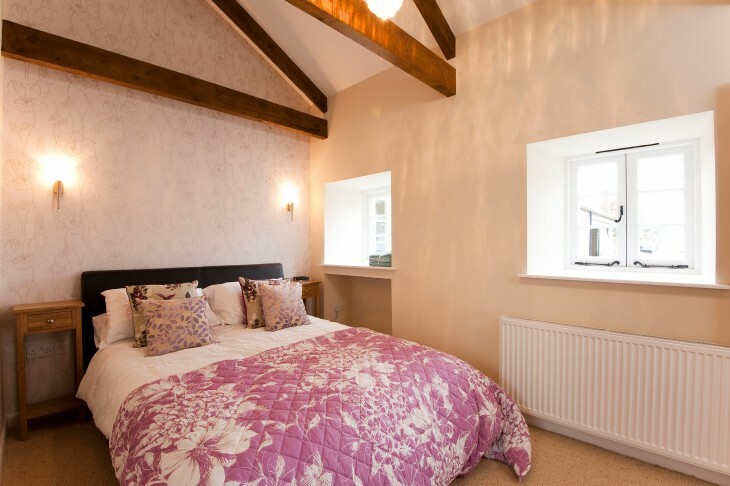 Set on a small courtyard of original buildings in the grounds of the beautiful house at Cosawes Barton, the Mill is fitted out to the highest of standards in a really comfortable style. We are delighted to say that Carvosso Mill has been awarded a Five Star Gold Award rating by Visit England for two consecutive years. Carvosso Mill is set out all on one level with ease of access for all – no steps and with easy access onto the garden together with a user friendly wet-room. The conversion has a fantastic octagonal full height space which was originally the farm horse engine house or ‘gin-gang’ where a horse would have turned the spindle and powered the farm threshing machine. This space now forms the superbly presented open plan living room and kitchen. The new bedroom areas would have been the stables for the hard working farm horses. Andy and Louise are to be complimented on the creation of such superb accommodation, facilities and fittings of the very highest standard and by bringing such wonderful character property up to 5*modern luxury. It has been such a pleasure to stay in this home from home and to meet such a friendly lovely family. It would be impossible to better our stay this week. A fantastic stay. The quality of the building is outstanding as is the warm welcome. Ruby loved the walks in the woodland garden even if she didn’t catch the rabbits. The history of Cosawes Barton makes fascinating reading and brings the place to life. We have had an excellent holiday and will be coming back for more. Thank you. Thank you for a wonderful holiday – if only we could have stayed longer a week is not enough! It’s great to find such a high quality dog friendly cottage so that we can all enjoy a holiday together…hope to be back to stay again soon! We have really enjoyed our stay. It was a pleasure to stay in such a light, spacious and tastefully appointed home from home. Very peaceful and quiet with easy access to all of Cornwall. Many thanks. Thank you for a super week! The Mill is perfect and equipped brilliantly with everything we needed. A fantastic first holiday with our baby boy. We would love to come again soon. We had a lovely stay, thank you. The home was exactly what we hoped and we found it very relaxing. We would definitely look to stay again. A fantastic location to discover the beautiful Cornish countryside and coast. A lovely cottage, rm. Look forward to returning and bringing more of the family. Thank you.